The exportable toolbox in order to export the virtual user and the simulation models to existing developer/design platforms that are already used for the design/development of mainstream ICT and non-ICT products. 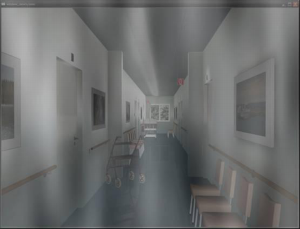 Figure 1: Simulation of visual impairments in immersive systems – unimpaired and cataract-impaired view. To investigate and develop an open library of various categories of virtual user models, including VR models, covering a wide range of population groups and especially focusing on groups in risk of exclusion, e.g. older people, people with disability (vision, hearing, speech, motor), people with co-existent condition, etc. To develop an Open Simulation Platform (OSP) for virtual reality simulation and testing of new products at all stages of iterative product planning and development, i.e. specification, design, development, validation and testing. To develop an extensive list of virtual reality tools for supporting accessibility testing at all stages of development of existing applications, of partners of the VERITAS consortium, in the following domains: a) automotive, b) smart living spaces, c) workplace design, d) infotainment and e) personal healthcare and wellbeing. To research and develop methodologies for introducing the VERITAS simulation and testing framework, including the virtual user and the simulation models, to a wide variety of ICT and non-ICT applications. To research and develop a framework for immersive virtual user simulation and testing, i.e. putting the developer in the position of the user through virtual/augmented reality simulation. 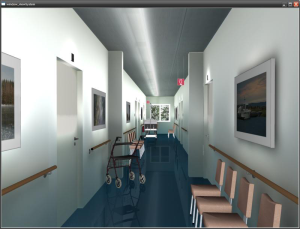 To define measures and metrics for evaluating software accessibility for every application scenario during design and development through VR simulation (graphs, statistics, distance metrics in general). To research and develop innovative concepts for ambient, multi-device, universally accessible and usable multimodal interfaces through VR simulation. The VERITAS project is founded by the European Community through the ICT programe under FP7.